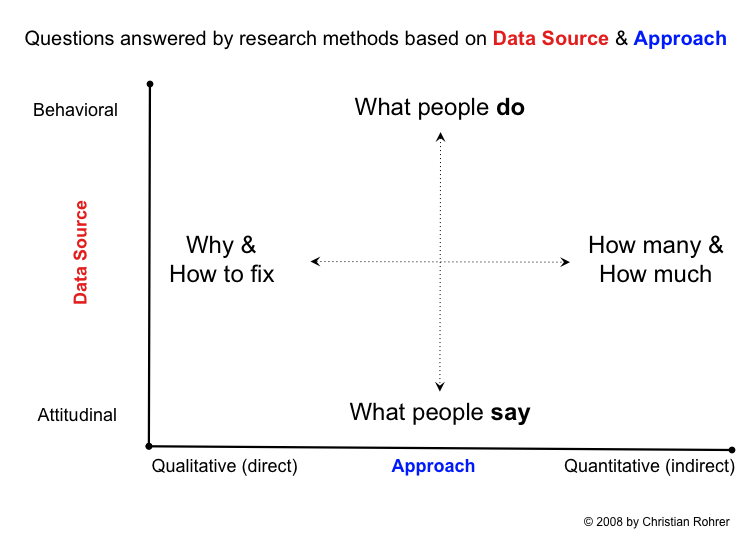 This is the Part II in the series The Why, How and What of UX Research. This post will help you get acquainted with the popular UX research methods. Knowing about them will help you choose the right method for the job and make your research more effective. At the strategy phase, your focus is on validating your ideas and looking for inspiration to proceed towards a solution. Either that, or you are exploring for new opportunities. At this stage, you should be looking for a combination of Qualitative and Quantitative research methods. In Early stages of your product, there is no substitute for talking to users directly. * Is the problem you are trying to solve even a real problem? Who are the people facing the problem? * Nailing these down are keystones for your project. Start with Proto-Personas and recruit users who match the personas. As you talk to more users, keep refining the persona. I would highly recommend a Jobs To Be Done style of interviews with at least 3 People. Update: We tried Google Hangout on Air for the interviews and found it to work quite well for remote interviews. You can do away recording mess too. Read more here. When you ask people about something that's not straight out of past experience - that requires analysis and imagination - you'll find that what they say is different from what they would actually do. They don't want to lie to you. They just aren't in the context. Contextual Inquiry often involves stalking the user (legally, of course) and collecting notes throughout the day. If your product is targeting a team and not a single user, you could be part of the team and get a clearer picture. Similar to Contextual Inquiry is the Experience Sampling or the Daily method. It involves interrupting the participant multiple times a day, asking them to make note of their observations or answer a questionnaire in real time. Instead of you making inferences, you are relying on the user to make note of his thoughts. A survey is a questionnaire on a random sample of your target population. Surveys help you make inferences quantitatively and see patterns on a much larger sample as compared to interviews. Use multiple choice questions. Aim for accuracy not precision. Keep questions granular and try not to combine measures. If you end up with more questions, cycle questions with different users. Once you have figured out that the problem you are trying to solve is worth solving, you can start optimizing the granular details of your design. This will help you arrive at an optimal solution and reduce risks of getting it wrong. Card Sorting is process for figuring out the optimal Information Architecture - how users would * expect* to find content or functionality. This knowledge is especially useful if you have a large number of categories and menu items. This involves your content to be laid out in cards and having your user sort them in order or lay them in hierarchy. Paper Prototyping is one of the cheapest and quickest way to iterate towards an optimal flow and user interface. You quickly sketch screens of the product on paper and conduct usability testing on them. To simulate the working of the prototype, just keep swapping the paper-screens manually as and when the user interacts with it or you can use the below mentioned tools to create a interactive digital prototype. Printable Templates you can use for faster prototyping. At this stage, you've built the solution and your users are already using it. It's now only a matter of verifying your decisions quantitatively and making continuous smaller improvements. That said, you may still have to combine methods from earlier stages to get insights. Usability Testing is a technique of testing your designs directly on your users. This requires that the user complete a few pre-determined tasks and follow to a think-aloud protocol, while you take note of your observations. As product-creators you will always know how your product is supposed to work, but your users won't. Usability testing is one of the best methods to escape this Curse of Knowledge. Most often you'll find your most important usability issues by testing on just 3 users. Heuristic Evaluation differs from Usability Testing in that, the test is done by an usability expert instead of a user. Many times you find yourself with alternative solutions and a good way to test them is in comparison. In A/B Testing, you show different versions to different users at random. You then measure their performance through analytics. It's all about the first impressions! The test involves showing your design to the participant for only 5 seconds and getting feedback on the salient features. Asking users what they remembered is a good way to confirm if your design is communicating the right message or if the Call-to-Actions are prominent enough. From the same train of thought as the 5 second test, the * first click* testing is about getting the actions right the first time. Given a certain task, will the user know where to click without having to probe through? Based on what stage you are at and what questions you are trying to answer, choose one or a combinations of these methods to conduct your research. If you have a question, need help conducting UX research or improve an existing product, I'd love to help. Just choose a time that works for you.